Malcolm Gladwell, author of best selling business books "Blink" and "The Tipping Point" and regular contributing writer for The New Yorker Magazine, gave a short talk tonight at U of T's Convocation Hall. The topic? His latest book "The Outliers". No, this is not a Clint Eastwood Western or a M. Night Shyamalan screenplay (although it could easily be the premise for the latter). No, and "Outlier" is a scientific term to describe things or phenomena that lie outside normal experience. The format was an informal interview by Rotman's Dean, Roger Martin in front of full house at Convocation Hall. Turns out, Martin and Gladwell grew up in the same community near Waterloo in the heart of Mennonite Community. Gladwell was best friends with Martin's younger brother Terry which produced some quite amusing stories and witty banter from the two scholars, making the 70 minutes fly by. 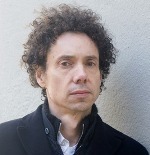 Gladwell, albeit peculiar in his ways, is a fascinating fellow chalk full of statistics, stories and analogies that make you go "hmmmm". He is a master at breaking down our perceptions and helping us to see things differently (although one of the first principals in his book states that to become a master (read: expert) requires 10,000 hrs of practise). The talk covered some of the concepts in his new book, The Outliers, with a focus on how some people (or groups of people) are successful in turning a disadvantage in life into an advantage. How compensating for ones weakness might actually be a more effective learning strategy than focusing on ones strengths. He talked about Community and how critical it is to overcoming obstacles and achieving success, however it may be painted. He talked of Human Capitalization (defined as the rate at which people reach their potential) and how the way we interpret success of others (or groups) distorts a simple truth that we choose to ignore. The flow of conversation zig-zagged from U2's new album to a better golf club; from John Grisham to Google, yet the delivery and message was amazingly brilliant and on course. What allows people with seemingly large obstacles in front of them to reach successes that no one would have imagined possible let alone likely. Why do so many successful business leaders and sports legends (from Charles Schwab to Tiger Woods) suffer from Dyslexia disproportionately to the general population? How is it that 9 of the worlds 75 most wealthy and powerful individuals since the beginning of recorded history were born in the same decade, in the same country, from disadvantaged families? Gladwell dispels our common beliefs and opens our eyes to another reality through interpretation of statistics, demographics and economic data that otherwise would give me a headache to read! Need a quick fix to beat the Decembuary blahs? I invite you to join me at the "Not My Dog," one of those small funky clubs that you've read about located smack in the naughty part of Queen Street West in Toronto - November 30th at 9:00 p.m..
We have a special treat, Canadian Singer/songwriter Stella Rose will be performing a live acoustic set of some of her material from her forthcoming CD. Haven't heard of Stella Rose? You soon will. Her fan base includes über iconic Canadian songwriter, Ron Sexsmith, who's own fan base includes Chris Martin of Coldplay and two old blokes called Elton John and Sir Paul McCartney. In addition, BBC Radio in the U.K. reviewing Stella, stated: "Wow - Her voice is incredibly strong - unbelievable!!". If your musical tastes include roots-rock in the style of Neil Young/ Tom Petty, flavoured with a pinch of country, delivered with a powerful, unique vocal style, you're in for a great evening. In addition to Stella, we've added Don Campbell, another young singer/songwriter to open the evening. Brand-spanking new and fresh out of the box, Don has and easy-going, laid-back style that's punctuated with some pretty nifty jazz guitar licks reminiscent of early John Mayer. The ladies tell me he's also very easy on the eyes although I don't see it myself - but again, I don't argue with ladies. So gather your significant other, (or find a significant other) and make a date to treat yourself to what's shaping up to be an incredible evening. Sunday, November 30th. "Not My Dog," 1510 Queen Street West Toronto - doors open at 9:00 p.m.
And I've left the best for last: admission is free, but space is limited, so get there early. If for some reason you can't make it, forward this to someone who needs a treat. Hold it... I did vote! Hey now... I did vote -- who says I didn't vote? Someone's spreading dirty rumours about little old me??!?? Send this video to all your American friends today! Do you understand how he US election actually is decided? This video works to explain the process in plain English. It is interesting to note that the US election is an 'all or nothing proposition' for each state's electors (see video to see what I mean), while in Canada the party with the majority of political ridings (similar to the US districts) wins the Federal election and therefore the Prime Minister. In America you vote for the person (and therefore the party), in Canada you vote for the political party (and therefore the person at the head of that party). This is great. Especially the dreidel part. I read this Harvard Business Review article over the weekend on the ride home from Detroit -- it is an excellent article on the topic of energy levels -- helps to identify how you can get more energy in the workplace and home. When you get a chance take the quiz and let me know how you come out. I answered 7-10 of these questions true -- I have some work to do here in terms of my own energy levels. If you are honest with yourself, you will see that you may also have an "energy crisis" looming.